Plastic Post Covers - Plasti-Sleeve - The original in post frame protection! Patented in 1994, our plastic post covers are in use in 10,000's of buildings nationwide, Plasti-Sleeve is the proven original for post and column protection. The pole shed has evolved into the modern post frame building and with that customers expect more than a bare chemically treated wooden post to support their investment. Plasti-Sleeve offers more by completely covering the embedded portion of the post or column with a molded plastic post cover with an enclosed bottom, designed to fit posts cleanly while still allowing ventilation. The clean fit means builders don't have to alter construction methods or worry about fit and finish of other framing members. We have done our "homework" through consultation, research, and construction to develop and refine a product that is simple to use, beneficial to Post Frame Design, and low overall cost! Consistency - People know plastic lasts indefinetly underground, what we don't know is what wood preservative formula will be next, CCA, ACQ, ACC or other so-called new generation methods. 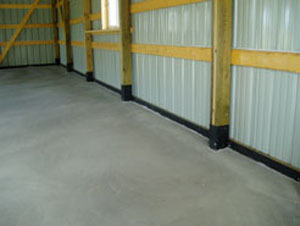 Whatever the preservative formula give your building's wood foundation the ultimate in post protection - Plasti-Sleeve. Can help dismiss customers concerns regarding column rot, decay, or insect attack, strengthen warranties and appraisals. Made from a high quality HDPE plastic which has an in-ground decay resistance of hundred's of years! Wide range of sizes - 19 different sizes to fit your plastic post covers needs! Versatility in uses: Side and end wall columns in Post Frame, porch columns, stub columns for sliding doors, deck and floor supports, mailbox posts, and many other applications. Can help eliminate column movement in heavy soils and or freeze/thaw conditions. A unique modern feature that gives you a quality edge over the "basic building" package. 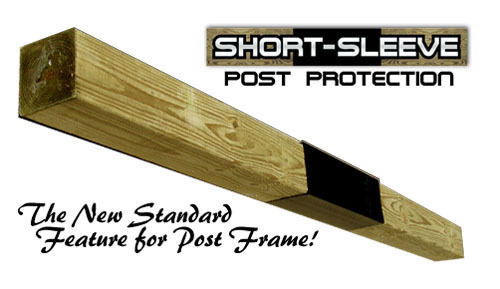 An easy to use product that won't interfere with the grade plank, or other framing members. 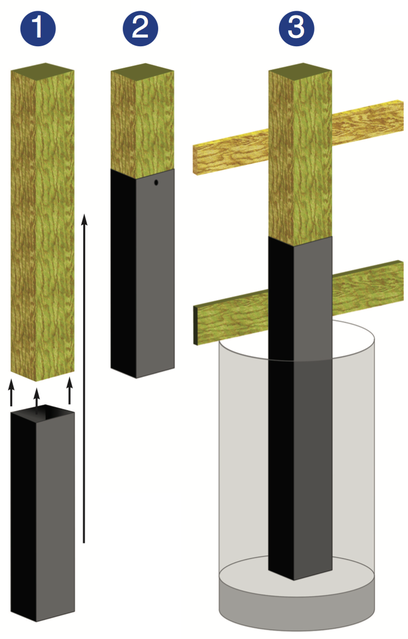 Retain the great Post Frame design advantage- A Solid Continuous column from footing to truss- No Splices! Raise your bottom line both on component sales and increased building sales! Lifetime Limited Warranty on Plasti-Sleeve. Many other post in-ground projects! Short Sleeve is an economical post protection sleeve that provides a tough plastic barrier at the posts critical decay area. 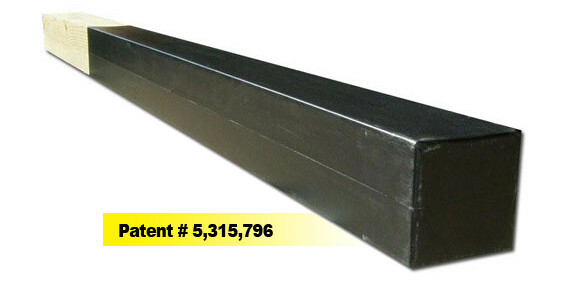 At 22" long this heavy duty polyethylene sleeve provides protection from the top of the skirt board to approx 14" to 18" below grade......ground zero for rot! Short Sleeve is an economical alternative to the full protection of Plasti-Sleeve. Available in all the same dimensional sizes as Plasti-Sleeve. Pro-Active product to increase customer confidence. Easy Slide-On_Installation - slide onto post and tack in place well above backfill area of post. Set, Align, and Backfill post in place. Once skirt board location is determined, remove tack and slide short sleeve down so top is uniform with top of skirt board location. Tack in place and install skirt board. Stock color is black. Custom colors are available by special order. Length/Weight …………4’ / 2 lbs. Length/Weight …………5’ 6” / 4 lbs. Length/Weight …………5’ / 4 lbs. Length/Weight …………5’ 6” / 4.2 lbs. Length/Weight ……………5’ 6” / 4.5 lbs. Length/Weight ……………5’ 8” / 4.5 lbs. Length/Weight ……………7’ 6” / 6 lbs. Length/Weight ……………6’ 6” / 6 lbs. Length/Weight ……………5’ 8” / 5 lbs. Length/Weight…………5’ 6” / 5 lbs. Length/Weight ……………5’ 8” / 6 lbs. Length/Weight ……………5’ 6” / 5.5 lbs. Length/Weight ……………5’ 10” / 5 lbs. Length/Weight……………5’ 6” / 5 lbs. Note: Plasti-Sleeve is a non-structural component for Post Protection. Most common attachments for uplift prevention can be used with Plasti-Sleeve. Use of sealant with these devices is recomended.